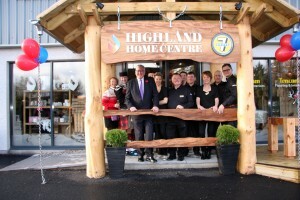 Aviemore in Inverness has been put firmly on the map following the opening of Cairngorm Spas’ new-look show centre – the Highland Home Centre. Now featuring a brand new café, plus a greater range of Hydropool hot tubs and swim spas, the centre is a one stop shop for all aspects of indoor and outdoor home and living. Established in 2011 by Brian O’Donnell, Cairngorm Spas has grown year on year and in March 2013 the company opened the original Highland Home Centre. This year the company took the decision to expand the centre even further to keep up with the increased demand for outdoor living products. “Our new expanded showroom with Route 7 Café opened in November and it has been full steam ahead since,” comments Managing Director Brian O’Donnell. The show centre is a hotspot situated along National Route 7, which links Sunderland to Inverness and forms two thirds of the famous C2C cycle route. Among the many products on offer are top of the range wood burning stoves, fi replaces, eco fans and accessories as well as hot tubs, chemicals and accessories, saunas, gazebos, BBQ’s, fi re bowls, soft furnishings and outdoor furniture. To read more of this story, subscribe today.